MPs vote for a new Speaker of the House of Commons to replace Andrew Scheer. Join CPAC on-air beginning at 11am ET / 8am PT -- and our online coverage here one hour later! It's job one for a new House of Commons: choosing a speaker. It takes precedence over all other parliamentary business, in fact. 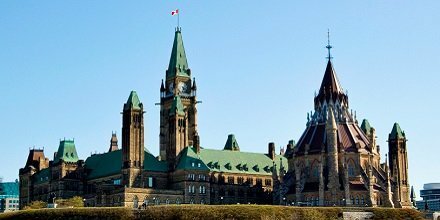 In this case, MPs will replace Andrew Scheer, the new opposition House leader for the Conservatives. La première tâche de la nouvelle Chambre des communes sera de choisir la personne qui succédera à Andrew Scheer au poste de Président. Cette tâche passe avant toute autre affaire à traiter au Parlement. There are four candidates on the ballot: Liberal MPs Denis Paradis, Yasmin Ratansi, and Geoff Regan, and Conservative Bruce Stanton. 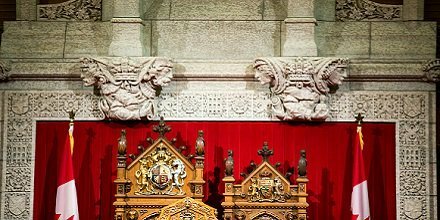 By tradition, the Senate speaker will first inform MPs that the Governor General will only read the Speech from the Throne once they have elected a speaker. fait que le gouverneur général ne lira le discours du Trône qu’après l’élection du président. A secret ballot has been used to elect Speakers since 1986, when Progressive Conservative MP John Fraser won after 11 ballots. Previously, the government put forward their preferred nominee with little opposition. The Dean of the House – the longest-serving MP who is not a minister, leader, or whip – oversees the vote. That would be Louis Plamondon of the Bloc Québécois. Hopeful speakers are allowed to address the House for up to five minutes. When there are no more speeches, voting begins after a 30-minute break. Portable booths are set up at the clerk's table inside the chamber to ensure privacy. The Mace, symbolic of the authority of the House of Commons, stays underneath the clerk's table until the new speaker is elected. Technically all MPs who aren’t ministers or party leaders can stand for election. To be removed from consideration, they have to inform the Clerk of the House by 6 p.m. the previous day. MPs will vote with a preferential ballot instead of the previous system of individual rounds. The Clerk counts and then destroys the ballots. MPs do not have to rank all candidates on the ballot. If no candidate receives 50 per cent, the last-place candidate is removed. Another ballot will be held in the event of a tie. Only the winner is announced. No specific results are kept. Speaking first is candidate Denis Paradis, Liberal MP for Brome--Missisquoi, Que. Next to speak is Liberal MP Yasmin Ratansi (Don Valley East, Ont). Geoff Regan (Halifax West, N.S.) is the third of four candidates to speak to colleagues. The speeches are in alphabetical order, making Conservative MP Bruce Stanton (Simcoe North, Ont.) the final speaker candidate to make his verbal pitch to colleagues. Speakers are often most visible during Question Period as they try to maintain order. But they’re also responsible for overseeing all daily business in the House, from debates to the introduction of bills. They are also responsible for the administration of the House of Commons, and chair the Board of Internal Economy. Deputy and assistant deputy speakers are named after the election after consulting with the parties. Le président est souvent le plus visible durant la Période des questions lorsqu’il tente de maintenir l’ordre. Cependant, il est également est chargé de surveiller au jour le jour les travaux quotidiens de la Chambre des communes, des débats à la présentation des projets de loi. Le président assume aussi la responsabilité de la direction et de la gestion générales de la Chambre des communes, en plus de présider le Bureau de régie interne. Le vice-président et le vice-président adjoint sont nommés après l’élection au terme d’une consultation avec les partis. The Speaker’s role is to ensure the rules and customs of Parliament are obeyed, protect the rights of MPs, and act as an impartial arbiter when deciding on motions, rulings, and requests. They only vote to break a tie, as Peter Milliken did in May 2005 on a failed motion of non-confidence. des décisions et des requêtes. 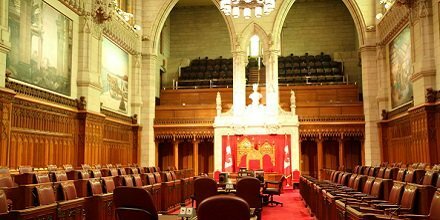 Le président ne vote qu'en cas d'égalité des voix, comme l’a fait Peter Milliken en mai 2005 pour une motion de censure qui a échoué. The speaker receives $80,100 in additional salary, a Centre Block apartment in the Parliament Buildings, and The Farm -- an official residence in the nearby Gatineau Hills. Le président reçoit un salaire supplémentaire de 80 100 $, et il a droit à l’utilisation d’un appartement dans l’édifice du Centre, au sein du Parlement, et de « La Ferme » – une résidence officielle située dans les collines de la Gatineau. Clerks have the authority to reject ballots with "unclear" intentions. 2011: Six ballots over seven hours are required to elect Andrew Scheer after the Conservative won a majority government. Scheer defeated NDP MP Denise Savoie on the final ballot. 2011: Il faudra six tours de scrutin et plus de sept heures pour faire élire Andrew Scheer après que les conservateurs aient formé un gouvernement majoritaire. M. Scheer bat la néodémocrate Denise Savoie au dernier tour de scrutin. 2008: With another Conservative minority, Milliken wins re-election after five rounds of voting. Seven other MPs were on the initial ballot, with many citing a lack of good behaviour in the House as their reason to run. 2008 : Sous un autre gouvernement conservateur minoritaire, M. Milliken est élu après cinq tours de scrutin. Les sept autres députés qui étaient candidats au premier tour avaient cité le manque de décorum à la Chambre comme motif pour se présenter. 2006: Milliken defeats fellow Liberals Diane Marleau and Marcel Proulx after the Conservatives won a minority government. Proulx pour accéder à la présidence après l’arrivée au pouvoir d’un gouvernement conservateur minoritaire. 2001: With the retirement of Parent, Peter Milliken begins his 10 years as Speaker by besting fellow Liberals Bob Kilger, Derek Lee, Clifford Lincoln, Dan McTeague, and Tom Wappel. 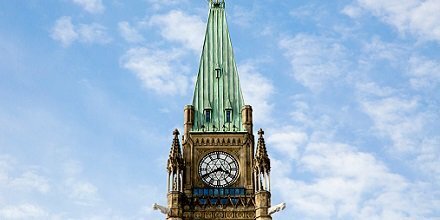 2001 : Après le départ à la retraite de M. Parent, Peter Milliken commence son mandat de 10 ans au poste de Président de la Chambre en battant ses collègues libéraux Bob Kilger, Derek Lee, Clifford Lincoln, Dan McTeague et Tom Wappel. 1997: Parent wins another term as Speaker over independent MP John Nunziata and Liberal Roger Gallaway. 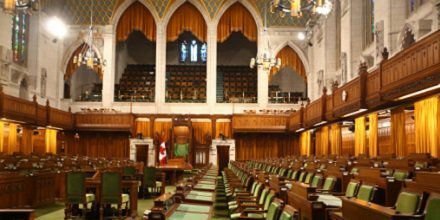 1997 : M. Parent obtient un autre mandat en tant que Président après avoir vaincu le député indépendant John Nunziata et le libéral Roger Gallaway. 1993: Liberal backbencher Gilbert Parent narrowly beats caucus colleague Jean-Robert Gauthier following a six-ballot election that took seven hours to complete. Parent and Gauthier actually tied on the fifth ballot. The following vote confirmed Parent as the winner. 1993 : Gilbert Parent, un député d’arrière-ban, bat son collègue libéral Jean-Robert Gauthier de justesse après une élection qui a duré sept heures et pris six tours de scrutin avec égalité des voix au cinquième. 1986: The first election to produce a Speaker of the House was one to remember. It took 11 ballots and 12 hours before John Fraser had a majority of MPs in his corner. l’appui de la majorité des députés. The new Speaker is dragged to the chair, pretending to resist, by the prime minister and leader of the opposition. Why the resistance? It's a symbolic show of hesitation. Becoming Speaker of the English House of Commons was once similar to signing your own death warrant. In the early days of the English Parliament, Speakers usually had to deliver any bad news to the king, such as a refusal to raise taxes. Some monarchs were less than charitable in their reactions. Nine Speakers were executed between 1394 and 1535. By tradition, the prime minister, opposition leader, and third-party leader will congratulate the new speaker. Regan is the 36th speaker since 1867. This concludes our live online coverage for today. 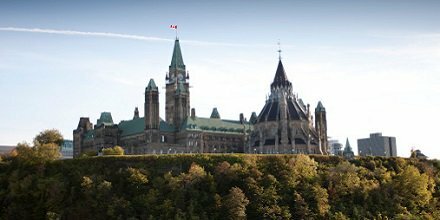 Please join us again tomorrow at 12pm ET / 9am PT for full on-air and online coverage as Governor General David Johnston reads the Speech from the Throne.